Ryanair are fast developing a reputation for being an unscrupulously crafty set of rip-off merchants, unfortunately from bitter personal experience I have to admit I have fallen foul of these shysters (can you have an Oirish shyster?) a couple of times and I consider myself to be quite a seasoned traveller. They may quite rightly boast that they have the "cheapest fares" in town but by the time you have added up all their little extras, which gather through their online booking process, and then taken into account that the majority of us will also fall foul of additional charges that they are not quite so keen to make apparent until you've been suckered into the position of standing in front of an increasingly impatient queue of fellow passengers. At this point they realise it's either quietly pay extra for baggage / boarding passes / toilets / stools / windows / oxygen or any one of the other chargeable gimmicks Ryanair throw into the equation, or face the humiliation of trying to stand your ground in front of the "the computer says" check in clerk. I recently witnessed an elderly couple, and by elderly I would guess early 80's, literally reduced to tears by Ryanair check-in staff who held them accountable for excess baggage charges without anything other than a grunted explanation of where they had to go and what they had to do to get their over weight bags on board the aircraft. I had to leave my wife and kids in an adjacent queue to take the completely bewildered elderly couple over to the ServiceAir desk at East Midlands airport to hand over their weigh tickets. I then had to explain why they had to pay their fee's and then return them to the check in to collect their boarding passes without even a suggestion of any assistance from any of the Ryanair staff in attendance. I swear if I had even seen a hint of a smirk on any of their faces I would quite happily have foregone my week in Puerto Banus for a night in the local nick after slapping one, or all, of them senseless. There may be many, usually very smug, travellers out there who tell their pals, and anyone else within 10 foot of earshot how they'd just flown to some far flung Ryanair destination for a penny. But I can guarantee by the time they've thrown the taxes, check in, baggage fee's etc., etc. into account, and the fact that Ryanair usually fly to some strip of tarmac miles from where they actually advertise they're going then they, like the rest of us innocents, are getting ripped off side ways and could have flown much easier, much closer with half the hassle. What goes around comes around they say and I'm quietly waiting for the day when I can think of that elderly couple at East Midlands airport and spare a crafty smirk to myself as the television news announces that "the worlds cheapest (but tackiest) airline" has bitten the dust. Not many will shed tears in my opinion. Ive flown ryanair and we went to my sisters wedding over in ireland from stanstead in june 2012. Everyone chipped in with their money and I paid it all on my bank card as Im the only one who's able to do so of those flying with me and its easier to group book so I thought. As we were booking the seats on my mum's laptop for a simple Friday morning out then Monday evening home the prices jumped up like a trampoline, out of proportion to the amount you'd expect them to in literally 5mins. How do they think people who fly ryanair can simply pay more at the drop of a hat? Its called a budget airline. And I do take the griper's point about the hidden costs like 19.99 taxes on a penny flight or a pound of extra weight charged as though it were an elephant. But Mr O'Leary has racehorses to pay for and train, can't expect him do that on the cheap, can he? I do agree that ryan air is not as cheap as you think, All this extra charges are mind boggling . on top of that you have to go to standstead, if you use a bus its another rip off. my experiences with EasyJet are much better . the prices are easier to understand and best of all they where most helpful on a couple of occasions when things went wrong without too much fuss, for instant I got stranded in cologne last year due to bad weather and easyjet put us all up in a 5 star hotel within 1 hour of knowing that no plane could go out. Now thats what I call customer care. I used to work for Ryanair as cabin crew (now work for a middle eastern airline) and although understand and sympathise with some peoples treatment by the airline some complaints are 'jumping on the band wagon' I feel. 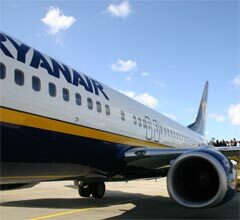 Ryanair as with most other airlines, budget or not charge for excess baggage (tip: if you take the correct baggage allowence with you to the airport they will not charge you for excess baggage, if you need more allowance you can quite easily purchase it online beforehand). In the gripe writers words 'I swear if I had even seen a hint of a smirk on any of their faces I would quite happily have foregone my week in Puerto Banus for a night in the local nick after slapping one, or all, of them senseless.' maybe, just maybe this sort of attitude hindures you slightly? and I dont share your opinion on Ryanair going bust, lots of people would lose their jobs including some who work at the airports that would be forced to close as a result. there are no hidden charges they are clearly stated on the website! dont think that any airline actually cares about you they are all there to make money, Ryanair carries more passengers per day then anyone else, someone things there ok?? I have just spent the morning trying to sort out my flight with Ryan Air. I fly tomorrow and when I went to check-in on line the status is uncomfirmed. I phoned and the payment is no cleared. they said they would phone me back within and hour. Two hours later I phoned again and this time the mattter cannot be delt with the person answering the phone - they will get someone to phyone me. So far I have spent 12 minutes on their premium line and so far no call back! LESSON - Read the large print on the confirmation and then for the life of me do I know who or how to resolve the fact that they have failed to take a payment for the flight. The account was in funds. If you fly with Ryanair, be sure to put the boot in when THEY fall short of their contractual obligations. For example, if they seat a fat guy next to you and he spills over into your seat, demand compensation for your discomfort. If they put a tall guy behind who asks you not to recline your seat, then demand compensation for not having the full rights to the seat you paid for and of course the discomfort and neckache it causes you. This of course applies to all airlines. Not just Ryanair...but Ryanair are particularly easy to hate. Thanks for the link cheep cheep. I watched it twice, it was priceless, very funny and says it all really! Ryanair have transported me on countless occasions between the UK and Bergerac/Limoges. I have not a single complaint, they are efficient, clean, speedy, inexpensive and polite. If you expect national airline service then don't fly budget. Thank you Ryanair. "Ryanair-the airline for the tracksuited. The football-shirted. The fat. The poor. The council-estater. The moron. The smelly. The common. The Sun-reader. I'd rather swim across the ocean with sharks eating my toes than fly with a shoddy airline and sitting sealed in a tube with these plebs." The hidden extra charges are disgusting. I booked a flight with Ryanair which by the time the extras were added on (even an £8 charge to pay for it!) it made the flight more expensive than other airlines. The flight crew were unfriendly and the check in was like like cattle market. So back from Sweden, where I flew with Ryanair (see comments below). Have to say that it was OK, with just one reservation. Check-in fine, take off on time, landed before time, bags waiting for us at the carousel. My only gripe was the priority boarding. Had paid for it both ways, but had to fight my way through the normal queue to find it - signage not good and staff not helpful. Other than that, staff seemed fine, friendly and helpful, so can't complain. Wish they would show more realistic prices, though. I think they'd still get the business if they did. EMA to Erfurt for a new destination please? one day a week? Ryanair-the airline for the tracksuited. The football-shirted. The fat. The poor. The council-estater. The moron. The smelly. The common. The Sun-reader. I'd rather swim across the ocean with sharks eating my toes than fly with a shoddy airline and sitting sealed in a tube with these plebs.